We believe that our faith in Christ is life changing. Our services contain both engaging music and a message encouraging the transformative life that exists in Christ. We hope that you come and worship with us as we connect with the God that made us and as we connect with one another. You do not have to be perfect to come here. None of us are – but we do expect God to work with you once you are here. As you begin to call this church home, join us in our mission to invite people to worship, grow and serve with Christ. We are located at 310 Alice Street, Exit 167A From I-16 East. Our primary entrance is located facing Alice Street. 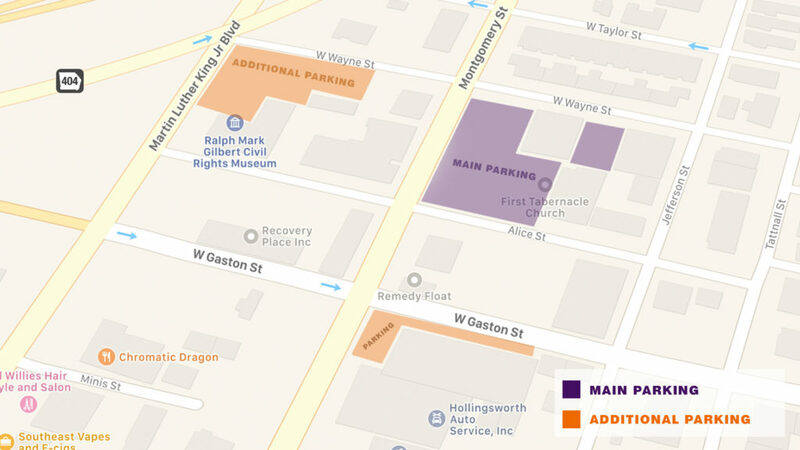 We have 47 parking spaces on our church property, which can be accessed via Alice & W Wayne Street. Each Sunday morning these spaces are reserved for the elderly and first-time guests. Street Parking is also available on Alice, Montgomery, Jefferson, and Wayne Streets. Directly Behind Sanctuary via W Wayne St.
Ralph Mark Gilbert Museum via W Wayne St.
Hollingsworth Body Shop via Montgomery St.